Yes, that’s true. I’m as surprised as you are. An entire year has gone by since my last post here. The combination of working full time, writing whenever I can, taking care of six doggies and two birds, and being a mom and wife have literally consumed me! And, no new western books out yet. I have some I’m working on, but again (see above) It’s really tough to get anything done these days. Sigh. So, what’s new on the horizon? First, my alter ego Pam Labud, has had some smashing news lately! First, she/I have signed with a new agent, Kim Lionetti at Bookends LLC, and now has a 4 book contract with Penguin Random House for their Loveswept Line. Her/my first book with them, To Catch A Lady, will be released on January 19th, 2015. She/I am so excited!!! Not only that, rumor has it, they are interested in Pam/me writing some contemporary western novels. How exciting is that? Very. I will keep you posted. Finally, there is more big news coming around the bend, but I can’t speak of it yet. Just know that one of these days soon, you’ll be seeing a lot more from Pam/me. I’ll post more info when I can. For now, Happy Reading everyone! Happy March and A New book! The world is struggling to survive in a nuclear winter. Maverick was one of several babies who were born, imbued with special powers, a result of being born under a ‘Blue Star’ radioactive bombardment. Her ex? He has a special gift that mutates him into a zombie destroyer. they can never really be together. 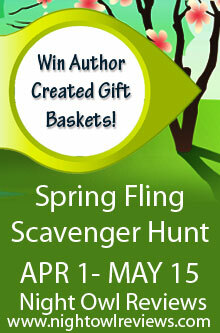 Come one, come all to the Spring Fling Blog Hop! Howdy everyone! Just wanted to let ya’ll know I’m participating in the Spring Fling blog hop. Go to the link below and check it out! Spring is On the Way And We Have A Winner! In spite of all the bad weather we’ve been having lately, fear not–Spring is on the way. I know, it’s hard to remember that while trudging through ginormous drifts of snow and enduring endless icy rain, but we’re more than halfway through the season. It won’t be long before snow will be gone and gardens will be blooming once again. I know don’t know about you, but I can’t wait. Born and raised in Illinois, February, March and April have always seemed the longest months of the year. On the flip side, however, spring always came and it was always glorious. Well worth the wait. I may be a Florida transplant (32 years!) but I’ve never forgotten living up north and dealing with bad weather–ie, fifty mile an hour winds and sub-zero temperatures. My heart goes out to all who continue to endure! Congrats to my winner bn100candg at hotmail dot com and thank you everyone for participating in this year’s Valentine’s Day Blog Hop. She’s getting a download of my book, Cole’s Redemption. That’s all for now, gentle readers. Until the spring thaw arrives, find a good book, a warm blanket and a cup of hot cocoa and settle in. Spring is on the way! Happy Valentine’s day and Welcome Valentine’s Day Blog Hoppers! Yes, gentle readers, it’s that time of year again–hearts and flowers, chocolate (or, whatever your sweet tooth prefers!) and for me a nice glass of Asti Spumante. In a word, awesome! As an added treat, this year I have the pleasure of joining in Skye Warren’s Valentine’s Day Blog Hop. Very cool! Some lucky Hopper is going to win a Kindle Paperwhite e-reader, not to mention other fabulous gifts. I’ll be giving away a download of my western romance, Cole’s Redemption. In addition, I wanted to make this a special stop on your tour, Hoppers, so I’m adding an extra treat this week, better than virtual chocolate and bubbly! I have secured an interview with the infamous magical personality, Cupid! LC: Uh, excuse me, sir, you are Mr. Cupid? MC (Mr. Cupid, that is): Yes ma’am, the one and only. LC: Forgive me, um, but you don’t really look like your picture. MC: Would those be the ones of the cute baby wearing only a diaper and holding a bow and arrow? LC: Yes, that’s the one. LC (nearly swooning at the thought): I get your point. So, Valentines day is your day. What’s the best part of being the purveyor of love? MC: I tell you, it’s a perfect job. Helping people find their true love, like you and Mr. C. for instance. 25 years of wedding bliss. LC: Thank you for that. MC: You’re welcome. Although, it’s not as easy as it looks. Most people say they want love, but you’d be surprised how resistant they are. MC: Really. But, that’s okay. Just makes me work a little harder. And, by the way, I’d like to thank you and all your fellow romance authors for keeping those wonderful stories going. Your efforts keeps the hope alive for millions of your readers. True love is possible and without that belief, no one would ever need a fella like me to help them along. LC: And thank you for taking time out of your super busy schedule to stop by. MC: You’re welcome. Happy Valentine’s day to you and your readers! You saw it here folks! Have a great day and don’t forget to keep hopping! Hello Weekend and Blog Hop winner Announced! Woo hoo! the weekend has finally arrived. I don’t know about you but the past couple of weeks have flown by. Here we are almost at the end of the month and I’m still reeling from the holidays. Not only that, but my sunny, warm and inviting Florida has turned to a cold, heartless witch these past few days. Brrrr. News flash: If you don’t turn on the heat function on your ac/heat pump until it gets cold, you don’ know it’s not working. Yikes! Lucky for me, one of my younger brothers is an AC installer. He knows all about this stuff. Since he’s a busy guy, I just have to catch him between jobs. Now, for the big news! I’ve chosen a winner of my book Cole’s Redemption from the Winter Wonder Man Blog Hop! I know it’s late coming in, but in addition to other crazy stuff, my email got jammed up and I missed getting the info out. Hugs to all the entrants! I hope it was a fun blog for everyone. bhometchko! Thank you everyone for participating! At the moment, I’m spending a wonderful, albeit very chilly weekend at the beach with my dear friend and critique partner! We’ve decided to take the opportunity to hole up and do some word wrangling this weekend. My goal? Finish Luke’s Destiny, book 2 of my series ‘Love Amongst the Pines’ series. (The first book is Cole’s Redemption) I just love my little town of Whispering Pines and the fun, quirky people who live there, I just had to go back! That’s it for now. I’ll post more info on the book’s release date as soon as I get it finished! I hope everyone is having a great year! I’m really excited to be announcing my participation in the Winter Wonder Man Blog Hop, hosted by H.D. Thompson. There will be prizes galore and I’ll be offering a free download of my book, Cole’s Redemption! The fun starts on January 16th and runs through January 19th. Hope to see you there! Is this a crazy, busy time of year, or what? I can’t believe how much there is to do and how much I haven’t even started. Are you the kind of person that dives right into the holidays? OR, are you like me, sit in a corner and deny it all until there is no choice but to get moving? To be honest, I really have to be ‘feeling’ the holiday spirit to participate. I’m not one to fold under the ga-zillion advertisements that are now starting after October 31st. I’m one of the last hold outs. What started out as a necessity (hello, small children, large debt) I always had to wait to do my shopping. Now, whether out of a long ingrained habit or the fact that my youngest will be home from college that week, I absolutely anticipate and savor that last week of insanity that is the holiday cheer. Bring on the large crowds, the hot cocoa and the holiday tunes! I’ll be ready. Yes, I’m still working on I’LL REMEMBER YOU and THE LADY AND THE GAMBLER. I was waiting for my alter ego, Pamela Labud, to finish up her release of TO RESCUE AN EARL, and complete the National Novel Writer’s Month challenge. Her new work, OPERATION OPEN HEART a fun, heartwarming medical romance, will be in deep revisions early next year. Other than that, I want to wish you all a Happy and Joyful Holiday season, my you get lots of presents, enjoy good food and friends, stay safe and start the new year with peace and love. Authors After Dark Give Away Party! If you missed the Authors After Dark Vampire Ball, don’t despair! The dark mistresses of the night are here to provide you with a taste of something sweet–a chance to win a pile of books from the authors who sponsored the Vampire Ball, and a limited edition booklet only available to Authors After Dark attendees! I’ve signed up and since I already have Kristin Painter’s book Blood Rights, I’ll take any one of the others listed. I’ll Remember You is the next book in my Whispering Pines series (second book after Cole’s Redemption). And, Miss Marie from Ride A Cowboy is finally getting her due in The Lady and The Gambler. Ante Up! Is the first book in the second Ride A Cowboy series. And, finally, I’m still laboring away on a saucy little menage western called Theirs To Protect. Thankfully, things have slowed down on the day job for a bit and I’ve cut myself to four days a week. Last month I attended the Romance Writers of America’s National Conference and had a great time. I went to every single workshop on indie publishing and let me tell you, I’m really pumped about getting my books out there. I’ve put together a new writing schedule and things are really shaping up nicely. Well, back to the books! I’ll post and let ya’ll know when the next book is coming out.